Home/panel extenders/Are Higher Cubicle Walls Really Less Green? As more companies move to a flexible work schedule to make the most of their office real estate, employees aren’t necessarily only coming in during daylight hours. Call centers (which absolutely must have high cubicle walls for good acoustic control) are often open 24/7. It makes sense to design your space around the way it is actually used – not around an imaginary concept of how it might be used. It’s true that more natural light can be a good thing. But there are ways to direct it into workspaces with higher cubicle walls while avoiding glare at the same time. For example, light shelves can be installed to redirect more sunlight downward into the room where it adds brightness without blinding anyone. The blinds above and below the light shelves can be adjusted for user comfort throughout the day. The bottom line is this: workers shouldn’t have to choose between getting enough sunlight and having cubicle walls that are the right height to provide privacy and noise reduction. 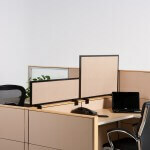 *Unlike making cubicle walls shorter, you can easily make them higher without buying new furniture. Simply add OBEX panel extenders to any existing cube panel. That’s always an eco-friendly choice.